Scarborough Castle is an early 12th century stone enclosure fortress, founded by William le Gros, earl of Albemarle. 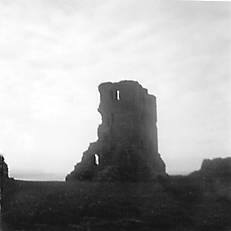 In 1154, it was appropriated by King Henry II and he founded the keep and bailey castle which remained in royal hands until the reign of King James I. The only approach to this extensive headland site, is guarded by a strong triangular 14th century barbican, consisting of a massive twin semi-circular towered gateway, a flanking wall and two smaller towers. The impressive great 13th century curtain wall with its eleven semi-circular flanking towers, is dominated by the ruins of the Civil War shattered 12th century keep. In the huge outer bailey are the remains of a Roman signal station of 370 AD, two chapels, a medieval hall and Mosdale Hall built by King John, reconstructed as a barracks in the 18th century and bombarded by German battle cruisers in 1914. In the town is King Richard lll House, 5 miles south-west is Ayton Castle and 9 miles south is Hunmanby Castle. Scarborough Castle is located in the town centre, off Castle Road. 40 miles north-east of York, on the A64. The site is owned by English Heritage and is open daily, April to September 10:00-6:00pm, Saturday and Sunday October to March 10:00-4:00pm.